​​Every year during the month of April we celebrate all entrepreneurship and the entrepreneurial careers! We organise tours, speeches, competitions and donate entrepreneurship books to further encourage the entrepreneurial career. We research and organise roundtable discussions advocating entrepreneurship policies that can create a more enabling environment for the career to become less of a myth in society, so people know that entrepreneurship is a career choice and a legitimate way to earn a living! We invite you to partner with us as entrepreneurship book donation sponsors, backers, patrons or benefactors, make a financial contribution to the book gift project, in exchange for the promotion of your image or name and together we can enable and celebrate business, trade, self-employment, intrapreneurs, entrepreneurs and their contribution to society. Lets give entrepreneurship its rightful place in society as a social and economic activity that has the power to activate dreams, transform lives and enhance economic development. ENTREPRENEURSHIP CAREER MONTH APRIL 2016. 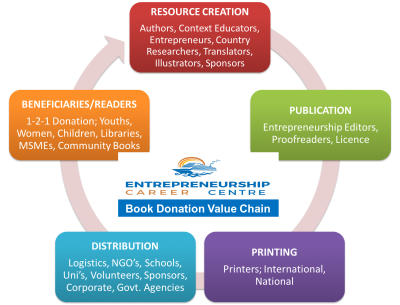 Entrepreneurship Career Centre (ECC) enables entrepreneurship book donations to cater to the entrepreneurship career, education and training. We produce entrepreneurship career books that can develop critical thinking, business and lifeskills facilitating entrepreneurship opportunity recognition and development in individuals al all levels. These resources support and empower the educational purpose of youth and adults toward Micro, Small and Enterprise (MSME) business start-up or growth. These entrepreneurship career books, formal & informal creative resources educate, transform lives, build capacity, skills, trade cognition and literacy, alleviate poverty, ensure autonomous and lifelong learning, expand horizons, advance readers and develop dynamism. Dynamic humans develop economies faster than natural resources. Entrepreneurial careers enable social and economic development. Entrepreneurship positively enhances life and societal development. National wealth depends on resourceful and entrepreneurial citizens. We can also assist you create the entrepreneurial career of your dreams!